Plastic surfaced USBs can be both custom branded and also have the underlying shell painted in a colour of your choice. Simply let the friendly USB Planet staff know the Pantone colour you would like emulated and they can make it happen! Unfortunately our team are unable to match plastic case colours for the CMYK colour suite. Confused by all the colour terminology? Don't worry, we'll take care of the technical side of things - just let us know if you need a fire engine red or a flamingo pink and our team members will guide you through the best colour match options for you. To help get you started, here are some of the most commonly asked questions re: colour matching plastic flash drives. 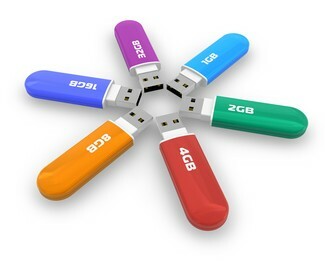 What is the minimum order quantity for colour matched flash drives? USB Planet's minimum order for matched plastic flashdrives is 50 units. Is there a set up fee for colour matching cases? Yes. This fee is normally around $80AUD but this price can vary depending on the USB and style and the colour you require. If in doubt please ask. Does it take longer to produce colour matched USBs than standard ones? No it does not, our standard turnaround time for both is 2 weeks from artwork approval. Are transparent colours available for all styles? Transparent colours are available for most styles, but may not be possible for some. Please ask the sales team if your desired model can be produced in a transparent colour match. Some of our most popular USB styles are produced with metal finishes. In fact at least a third of all styles in our collection here at USB planet are made from metal or have metal parts. We can absolutely still colour metal USBs, but due to their construction the colour range is limited when compared with the plastic cased USBs. The process used to colour metal surfaces is called anondization and it allows for the adherence of colour to metal using a special electrolyte technique. The resulting surface boasts a gorgeous metallic finish where the colour looks to be part of the natural metal surface rather than having a "painted on" look. This process allows for basic colour tones, such as blue, green, red, yellow, orange, pink, purple, turquoise, black or white. It is an amazing effect that adds further custom appeal to already stylish products. Metal surface anondization is suitable for all metal surfaces with the exception of some stainless steel surfaces. Please ask us to confirm which particular style of flash drive may be excluded from anondization. Anondization can incur an additional fee, which will vary depending on the colour required for your products - again, please check with our staff as to what additional costs may be involved in anondizing your metal outer USBs.